Eleven months ago, if you were to tell me I ran one full marathon and two half marathons within a three week period of time, I would have told you that you're mental. Yet here I sit, sore angry legs and all. We stayed the night before the race at the Vinoy Renaissance in St. Pete, luckily for us - this is where the expo was being held. We grabbed our goodie bag and got everything ready before dinner. I was a crazy pink lady for sure. For dinner, Keri and I decided to split a burger at Vinoy's casual restaurant Alfresco's. Through the past year, we have both gotten smart enough not to overeat the night before a half marathon. This burger happened to be one of the best burgers I have had in the Tampa / St. Pete area. I am a burger snob and good lord this was delicious. The hand cut fries had old bay on them. Sure - a fatty cheeseburger may not be the best pre-race option but we loved it! The Vinoy was an amazing hotel with super comfortable beds. Not to mention, Aveda body products. I was practically stalking housekeeping! Keri and I watched youtube self help videos on how properly wrap my ankle with KT tape. I can tell you my ankle survived. Next thing we knew it was time to wake up on Sunday morning. This course started and ended outside the Salvador Dali museum! This particular day was in the mid 60's with 15-20 mph wind gusts and was overcast. I prefer running on overcast days. After a pain free few miles, I saw a hot dog in the distance. As a huge Disney fan, I instantly thought of the Hot Dog Song and wanted a photo - as we got closer, I realized the hot dog was a friend of mine - Kat of Sneakers and Fingerpaints. This excited me a great deal! HOT DOG! As we went along, I was doing shockingly ok. One thing I have not shared on my blog is that I have had bronchitis since we left NYC the first week of November. I pushed through at Wine and Dine, which made it worse. I haven't laced my sneakers up since I crossed the finish line at the Wine and Dine Half Marathon. Up through mile 8, Keri and I were in great condition. When 8 hit, we both needed a medic tent, one that I didn't see after mile 6. I am certain they were there but we couldn't find one. She needed anti-chafe while I in desperate need for Tylenol. I pushed through - with an injured foot and a bronchial cough. 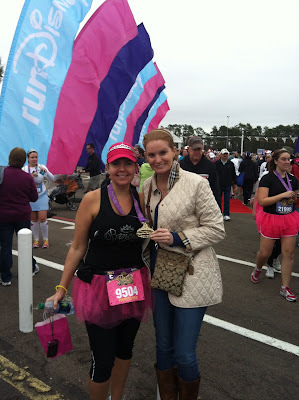 Keri and I enjoyed our race together. 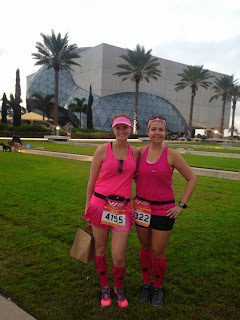 Although we fight like sisters, we think exactly alike when it comes to running races. We were there to have fun and collect the bling & bubbly at the end of the race. Overall, the race series was amazing and a perfect girls race weekend. I enjoyed Keri's attendance and am looking forward to our next race together! Congrats on your race! Hope you're getting some much needed rest!